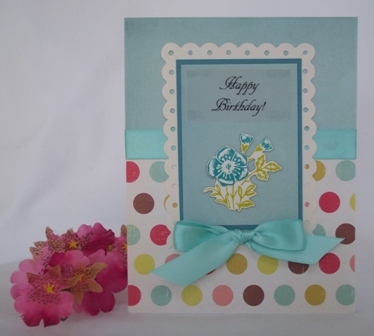 This handmade birthday card idea is cute and easy to make with polka dot paper and a satin bow. 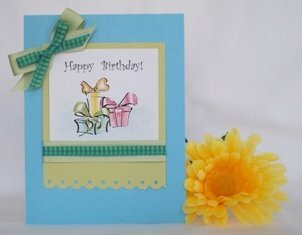 For this birthday card I used a border punch, stickers and satin ribbon. 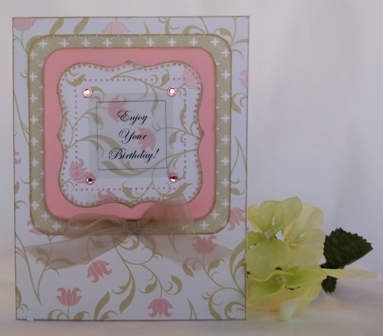 To make a birthday card like this one, use a scallop border punch to create a frame for the sentiment. 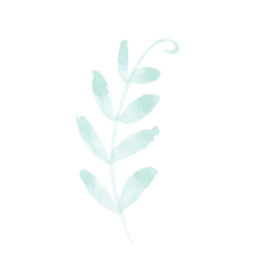 I used dark teal paper and cut it about 1/4" large than the size of the light teal paper. 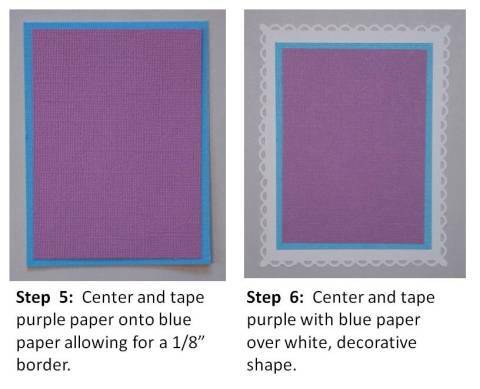 I then placed the dark teal paper behind the light teal paper allowing for about a 1/8" border. I used my laser printer on this birthday card design and printed out the sentiment on vellum paper but you can use a stamp or adhesive letters. If you'd like to know what border punch I used, it's Fiskars Threading Water. This punch is a good one to have in your tool box because it's versatile. 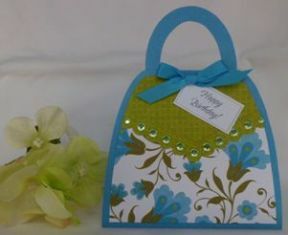 This birthday card was created using a corner punch and Martha Stewart's Punch Around the Page, Cherish. The sentiment was printed on vellum paper. The paper was layered using a tan and pink color combination. I have a few favorite punches that I like to use. 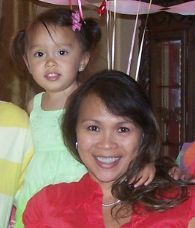 And this is one of them. 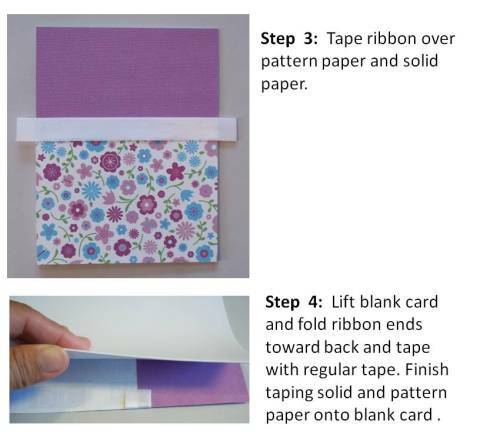 To see Martha Stewart's Punch Around the Page, Cherish stamp and many of the punches I recommend, click here. 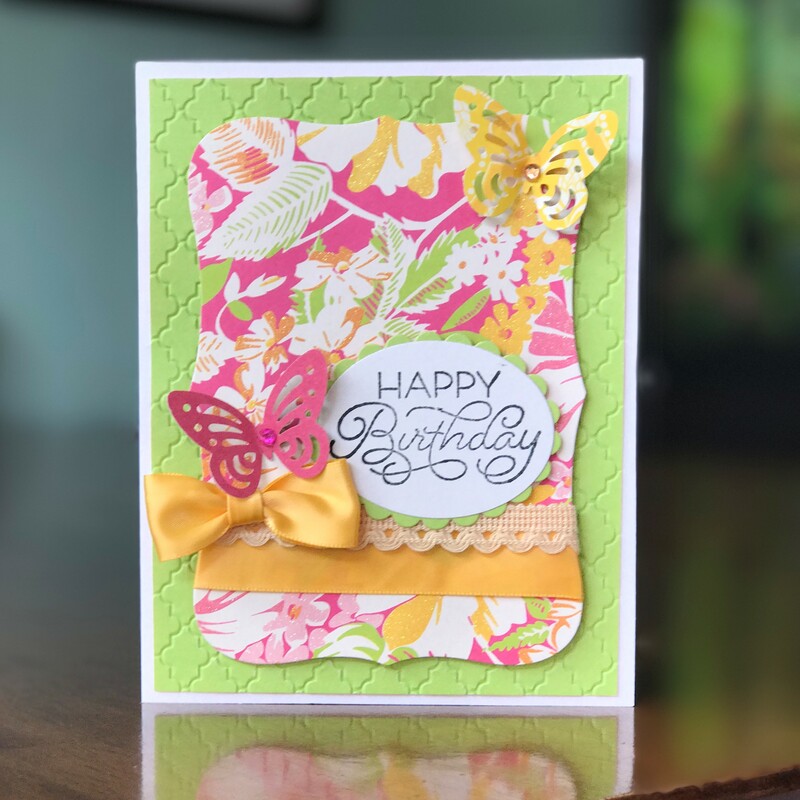 For this handmade birthday card idea, I used the same border punch as the polka dot card above (Fiskars Border Punch Threading Water). The only difference is that I used it on one side of paper, on the bottom side. 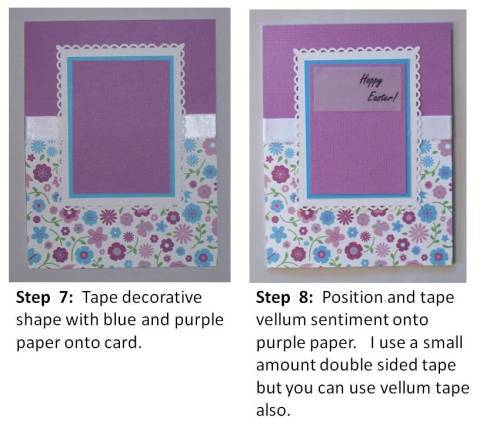 I embellished this card with gingham and grosgrain ribbon. The image of presents were colored in. 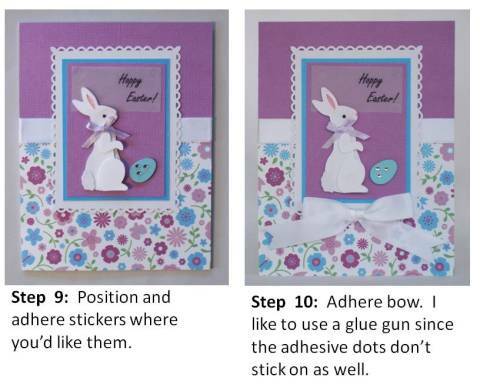 This is pretty simle and quick card to make if you need something fast. Here's a birthday card that I made using a software program called E-Card Wizard. 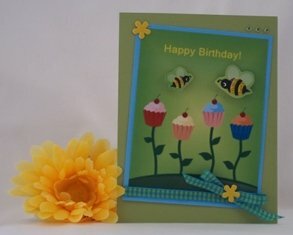 It allowed me to print out the cupcake images along with the butterfly. 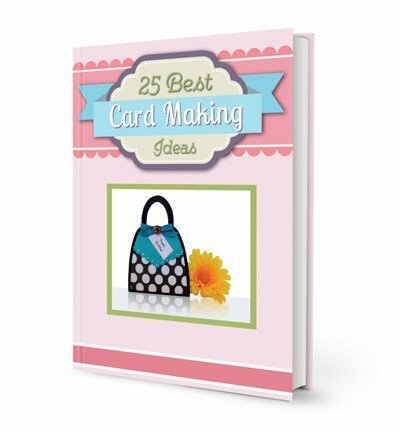 This makes card making a lot faster. 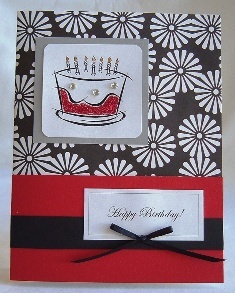 This red, black and white card above features a birthday cake that I embellished with glitter and adhesive gems. You can customize the colors if you'd prefer another color other than red. Then color the cake with the color you choose. 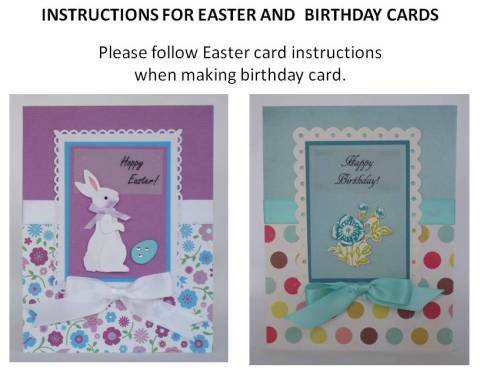 So here are instructions to make this card. 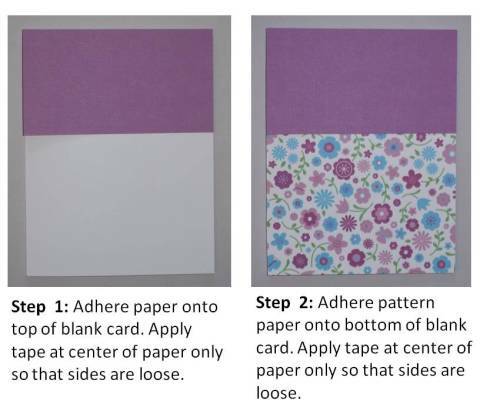 I've tried to make it as simple as possible so you can easily make this card yourself.